Here's Emily...still in her box of course! They will obviously look a lot better when they're not tied down!! They have beautiful, long hair which can be washed and styled. Not sure if I'm going to tell Kate & Amy that just yet! I've bought some accessories for each doll as well.....a hairbrush each and some extra shoes. Isn't that wild, red hair gorgeous!! I just LOVE it :) No brushing this wild mop though! She's wearing the trial run of the party dress I'm going to make for Emily & Jasmine. Emily's will be a pale blue version of this and Jasmine's will be pale yellow. I made the little sandals too but they need a bit of refining yet, for me to be totally happy with them. I'll be back soon with some more photos of the clothes I've made so far. 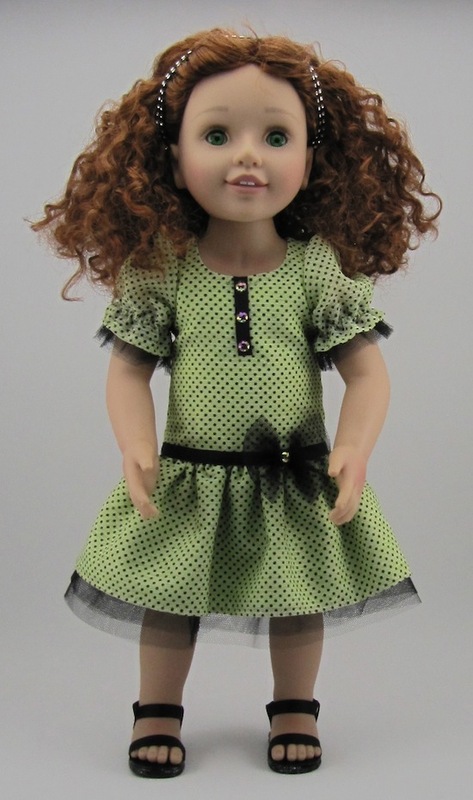 The dolls are beautiful and so is the dress and sandals you've made for them. I can't wait to see more. The dolls are beautiful Lynne. I especially like the last one. My hair isn't that light or that thick, but you can hardly brush my mop either. hee hee The dress is adorable in polka dots and I love the tulle peeping out from the hem. Great start to your new blog sweetie! Hugs! These dolls and all the clothes you're making for them are going to be a hit!